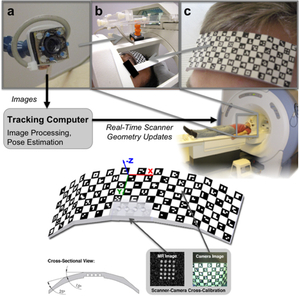 The tracking and compensation of patient motion during a magnetic resonance imaging (MRI) acqusition is an unsolved problem. For brain MRI, a promising approach recently suggested is to track the patient using an in-bore camera (see Figure 1). Features for the tracking were obtained from a checkerboard marker attached to the patient's forehead. However, the possible tracking range of the head pose is limited by the locally attached marker. For pose estimation, the detection algorithm requires the checkerboard marker entirely visible inside the camera’s field of view (FOV). Due to the limited space inside the scanner bore, camera-marker distances from 5-7cm restrict the FOV significantly, which directly affects the possible tracking range. To overcome this shortcoming, we developed a novel self-encoded marker (Figure 1c) where each feature on the pattern is augmented with a 2-D barcode. Hence, the marker can be tracked even if it is not completely visible in the camera image. Compared to the detection of the checkerboard marker, the detection algorithm of the self-encoded marker was extended by a feature identification and verification step as shown in Figure 2. Given the known pattern including the embedded codes of the self-encoded marker, a mesh of all neighboring quads on the pattern was loaded in a look-up table at the start of the software. Thus, this information can be exploited to verify the detected codes. 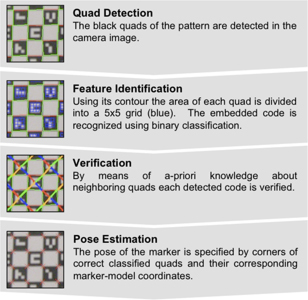 Instead of verifying each code independently, we used the recognized codes of neighboring quads for verification. Thus, the self-encoded marker offers considerable advantages over the checkerboard marker in terms of processing speed, since it makes the correspondence search of feature points and marker-model coordinates, which are required for the pose estimation, redundant. For evaluation, experiments with computer controlled motion outside the scanner were performed. 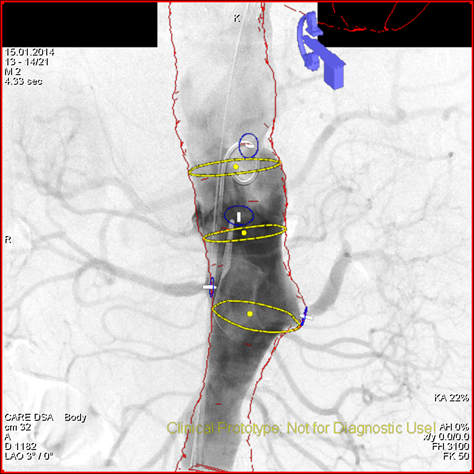 Phantom studies inside the scanner and first in-vivo experiments showed promising results. Even in the presence of strong continuous motion, the scanner geometry was sufficiently updated using pose estimates of the self-encoded marker. In this way, the structure of the brain was recovered as shown in Figure 3. In this study, we presented a novel marker design, which overcomes the limiting tracking range of existing optical prospective in-bore motion correction systems. <b>Figure 1:</b> Setup of the optical motion correction system: the MR compatible camera (a) was mounted on the 8 channel head coil (b). 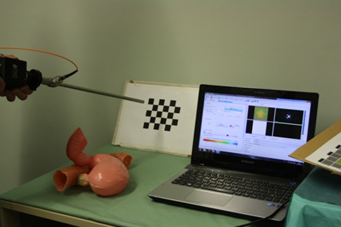 Reliable features for optical tracking of the patient were provided by the self-encoded marker (c). <b>Figure 2:</b> Workflow diagram of the detection algorithm for the self-encoded marker. This algorithm can be divided into quad detection, feature identification, verification, and pose estimation. 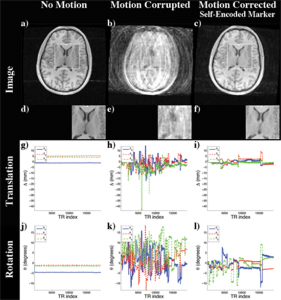 <b>Figure 3:</b> Images of the scan simulating an uncooperative patient: (a) Reference Scan; Scan with random motion and (b) no correction and (c) prospective mo- tion correction using the self-encoded marker; (d-f) Magnification of window in (a-c); Detected translation (g-i) and rotation (j-l).